(PRLEAP.COM) O'FALLON, MO – APRIL 2, 2019 Dr. Thomas Wright, Medical Director of Laser Lipo and Vein Center announces the addition of Emsculpt, the first and only non-invasive body shaping procedure that simultaneously addresses both Muscle and Fat. Emsculpt introduces an entirely new techology to the category that goes beyond waist line reduction and elimination of fat cells. This dual treatment addresses physiological distinctions currently excluded from other procedures, such as muscle, making it ideal for fit individuals with a lower BMI seeking improvement in muscle and fat in hard to target areas. "Muscles represent about 35% of the human body, but existing aesthetic treatments only focus on the reduction of fat and fail to address muscle," said Dr. Wright. "Emsculpt now offers a procedure to treat our fitness focused patients who are not candidates for existing technologies as they don't have bulk or excess fat to lose. By finally addressing muscle tone, this treatment supports an individual's dedication to an active and healthy lifestyle, helping them address and further define those particulary stubborun areas," said Dr. Wright. Emsculpt is FDA-cleared for the strengthening, toning and firming of the abdomen and buttocks. The game changing technology helps fit patients achieve next-level, abdominal contouring results and increases the strength and stamina of the gluteal region to help athletic patients take their buttocks to the next level. 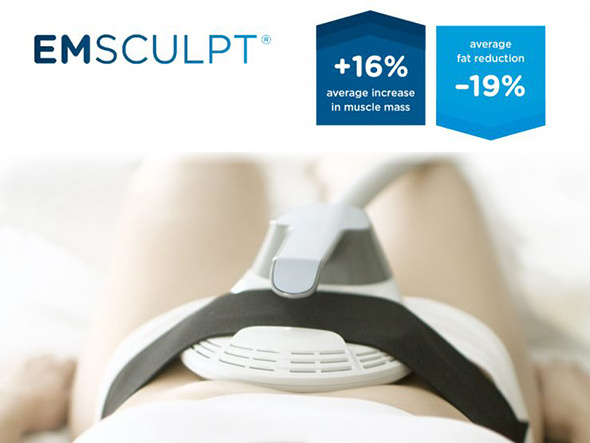 Utilizing HIFEM® technology, Emsculpt offers a first-of-its-kind application of a unique magnetic field which penetrates through skin to deliver almost 20,000 muscular contractions per 30 minute session to impact muscle, as well as fat. Once penetrated, the energy induces supramaximal muscle contractions that are accompanied by a rapid metabolic reaction in fat cells to not only strengthen and build muscle, but also reduce fat. This is the ONLY technology that builds muscle and burns fat simultaneously, all while leaving the surrounding tissues unaffected. Dr. Wright is a leader in minimally invasive and non-invasive body shaping treatments. He has authored several peer reviewed articles on the safety and efficacy of minimally invasive procedures. For optimal results, Dr. Wright recommends four 30-minute sessions over the course of a two-week period. Best results will be seen after 3-months with continued improvement over a 6-month period. The Laser Lipo and Vein Center, located at 830 Waterbury Falls Drive, Suite 202 in O' Fallon, MO is hosting an informational open house on Monday, April 29, from 4:00 – 7:00 PM. Please call 636-397-4012 for more information or to RSVP to the event. 2018 BTL Group of Companies. All rights reserved. BTL®, EMSCULPT® and HIFEM® are registered trademarks in the United States of America, the European Union and/or other countries. 1–6 Presented at the Annual Meeting of the American Society of Lasers in Surgery and Medicine, 2018 Dallas TX. 7 Data on file. 1. Kent D, Jacob C. Computed tomography (CT) based evidence of simultaneous changes in human adipose and muscle tissues following a High-Intensity Focused Electromagnetic Field (HIFEM) application: a new method for non-invasive body sculpting. 2. Kinney B, Lozanova P. High-Intensity Focused Electro-Magnetic (HIFEM) therapy evaluated by magnetic resonance imaging (MRI): Safety and efficacy study of a dual tissue effect based non-invasive abdominal body shaping. 3. Katz B., Bard R., Goldfarb R., Shiloh A., Kenolova D. Changes in subcutaneous abdominal fat thickness following High-Intensity Focused Electro-Magnetic (HIFEM) field treatments: A multi center ultrasound study. 4. Weiss R, Bernardy J. Induction of fat apoptosis by a non-thermal device: safety and mechanism of action of non-invasive HIFEM technology evaluated in a histological porcine model. 5. Jacob C., Paskova K. A novel non-invasive technology based on simultaneous induction of changes in adipose and muscle tissues: Safety and efficacy of a high intensity focused electro-magnetic field device used for abdominal body shaping. 6. Busso M., Denkova R. Efficacy of High Intensity Focused Electro-Magnetic field therapy when used for non-invasive buttocks augmentation and lifting: A clinical study. A multi-center efficacy and safety study.